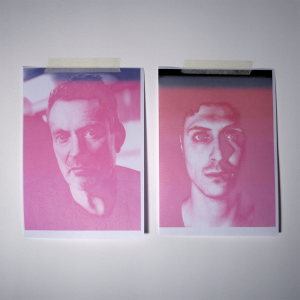 Bernholz has been collaborating with Neil Arthur of Blancmange. Their new project is called ‘Near Future'; the duo have produced music and artwork through a series of timed email exchanges, resulting in the angular, percussive ‘Ideal Home’ as their debut single. The shared vocals and atmospheric production (with lyrics by Bernholz) maintain a balance between cold, detached observation and human feeling. The track has already received airplay courtesy of Gideon Coe on BBC 6Music. Meanwhile, the B-side ‘Overwhelmed’ is more emotional. A quietly moving piece of music written and recorded by Bernholz, the track inspired Neil Arthur to write the words, take the lead vocal and add some further loops and sounds. ‘Ideal Home/Overwhelmed’ will be released on Blanc Check Records on 22nd April 2016. There are limited signed promo CDs available online. Near Future will be recording more material throughout the year and plan to release their debut album in 2017.